J. Aggabao, M.S. ’13, knew it wasn’t going to be easy to land his dream job as a strength and conditioning coach in the NFL. But that goal got more attainable in winter 2013, when Aggabao was a graduate student in Illinois State’s exercise physiology program. That’s when ISU alum Jeff Friday, M.S. ’92, returned to campus to meet students and talk about his 16-year career as an NFL strength coach, including a 2000 Super Bowl win with the Baltimore Ravens. For Aggabao, his chat with Friday in a campus weight room was inspiring. 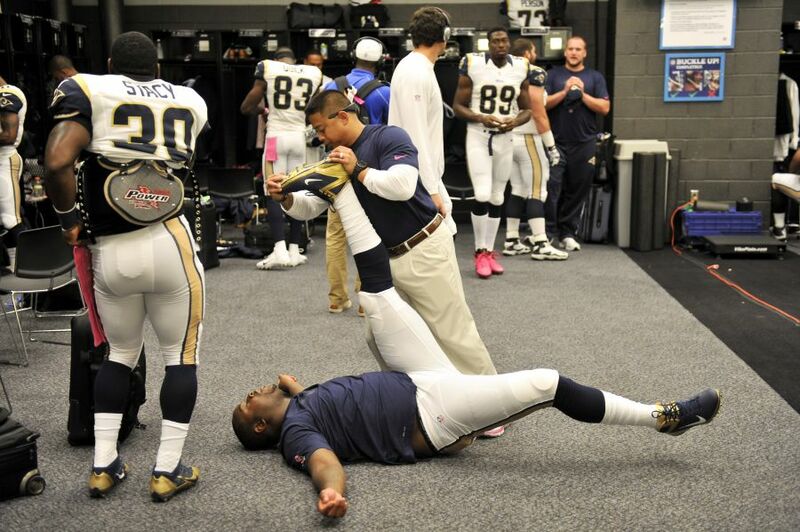 Today, Aggabao is an assistant strength coach with the St. Louis Rams, an elite job that’s exactly as cool as it sounds and way more data-driven than you can imagine. He’s now in his second season with the team, after successfully turning a yearlong internship into a full-time job—one of only 80 in the league—in March 2014. His time at Illinois State—including the Friday visit—was instrumental in reaching the NFL, but so was the journey that took him to Normal. Aggabao grew up on Guam before moving to the U.S. in 1997. After the September 11 terror attacks, he joined the Navy and served for five years. It was in the Navy where he started to really lift weights, later turning that budding interest into an undergraduate degree in kinesiology and movement studies from Washington State. For his master’s, Aggabao chose Illinois State because of the School of Kinesiology and Recreation’s well-regarded graduate assistantships. After arriving at ISU as a nontraditional student in 2011, Aggabao’s GA position made him an assistant strength and conditioning coach for football, men’s and women’s basketball, track and field, and gymnastics. As graduation neared, Aggabao began cold-calling a half-dozen NFL strength coaches, asking for a gig. Eventually, one called back—Rock Gullickson, the Rams’ head strength coach. He got the internship in March 2013. So how’d he do it? Aggabao credits his education in the exercise physiology program for exposing him to the latest research and technology being used by professional strength coaches, as well as the industry connections of ISU faculty and staff such as Jim Lathrop, the director of strength and conditioning for the Redbirds. Aggabao also brought to the table some real life experience and maturity—all traced back to his Navy days. Now in the middle of the NFL season, Aggabao works seven days a week, mostly in the weight room with players. His day-to-day job is not what some people expect, Aggabao says. Every day, he puts his statistical skills to use on a data-driven player report that’s shared with Head Coach Jeff Fisher and his staff. Aggabao returned to Illinois State in September, while the Rams were on a bye week, to watch the Redbird football team defeat Austin Peay and visit with the coaching staff and players.